Full-text sermons and audio keyed to the A-B-C Lectionary Cycle -- plus Children's Messages and Prayers. Access thousands of additional sermons by Topic, Scripture, Lectionary date, or any word or phrase. Browse our library of more than 16,000 powerful illustrations with new material added on a regular basis. Our subscribers say it best. 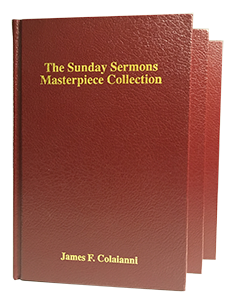 Here's what your fellow preachers have written about Sunday Sermons! For the many the years I have been receiving Sunday Sermons it has been a tremendous help in my work. I wish to express to all of you my profound thanks and gratitude for your excellent publication! Thank you for your fine service. I can't tell you how much your service has meant to me over the years. I have had a most successful ministry and I owe that, in part, to your company. Preaching is still the most important part of liturgy, and my relationship with you assured me that my preaching would be excellent.